MusicSoft has just released an interesting piece of hardware that allows musicians to dump the MIDI output of their instruments to a standard cassette tape. 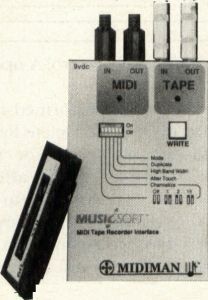 MIDIMAN, a MIDI tape-recorder interface, grabs the performance in real-time, after which the musician may play back the tape and recreate the music. MusicSoft president Tim Ryan says, "MIDIMAN was designed as an easy-to-use, cost effective means for recording any MIDI data, especially sequences, directly to standard audiotape." The unit also provides a back-up mode for copying tapes. Sales and Marketing Vice President Toby Odell says that the unit operates as a virtual "player piano" that allows musicians to record MIDI without having to buy an expensive computer and sequencing software. MIDIMAN is priced at $199.95. MusicSoft president Tim Ryan says, "MIDIMAN was designed as an easy-to-use, cost effective means for recording any MIDI data, especialy sequences, directly to standard audiotape." The unit also provides a back-up mode for copying tapes. CIRCLE #112 ON READER SERVICE CARD.